SSCC Theatre is pleased to announce the addition of two shows to their 14th Season! The Diaries of Adam and Eve, by Mark Twain. A uniquely American theatre piece, funny, beautiful, and deeply moving. A light-hearted look at the world’s first love story through the eyes of America’s greatest humorist, Mark Twain, whose Garden of Eden bursts with wit, laughter and the lyric poignance of the first love and the first loss. 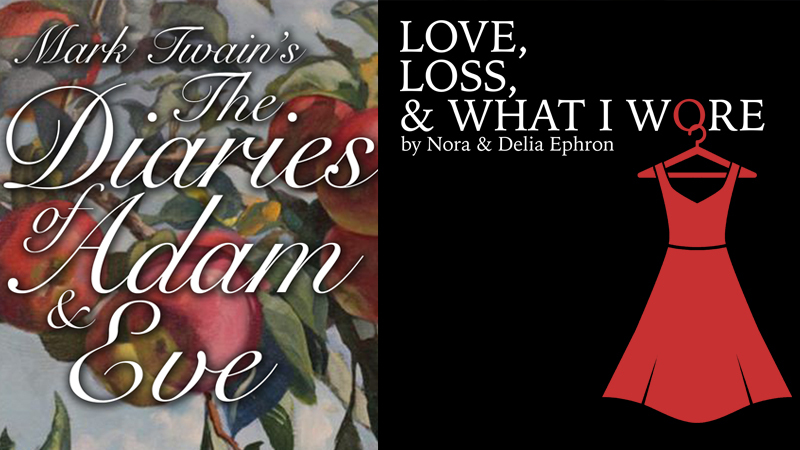 The Diaries of Adam and Eve plays Friday, September 15, 2017 at 7:30 p.m.
Love, Loss, and What I Wore, by Nora and Delia Ephron. A play of monologues and ensemble pieces about women, clothes and memory covering all the important subjects—mothers, prom dresses, mothers, buying bras, mothers, hating purses and why we only wear black. Based on the bestselling book by Ilene Beckerman. Love, Loss, and What I Wore plays Saturday, February 17, 2018 at 7:30 p.m. Presented by SSCC Theatre Company, these readers theatre productions will be performed one night only. Tickets will be available to each of these shows for only $5, and are free to 14th season ticket holders. Season tickets are available now and can be purchased here. Death of a Salesman, by Arthur Miller. The story revolves around the last days of Willy Loman, a failing salesman, who cannot understand how he failed to win success and happiness. Through a series of tragic soul-searching revelations of the life he has lived with his wife, his sons, and his business associates, we discover how his quest for the ‘American Dream’ kept him blind to the people who truly loved him. Death of a Salesman opens the season November 3 – 5, 2017. Dead Man’s Cell Phone, by Sarah Ruhl. An incessantly ringing cell phone in a quiet café. A stranger at the next table who has had enough. And a dead man—with a lot of loose ends. A play about how we memorialize the dead, and how that remembering changes us, it is the odyssey of a woman forced to confront her own assumptions about morality, redemption, and the need to connect in a technologically obsessed world. Dead Man’s Cell Phone runs April 6 – 8, 2018. Dead Man Walking, by Tim Robbins. Based on the successful book and film, Sister Helen Prejean, a catholic nun, receives a letter from a death row inmate by the name of Matthew Poncelet. Poncelet was sentenced to Louisiana’s death row for killing two young teenagers. Although Poncelet was sentenced to death, Carl Vitello, his accomplice, was sentenced to a lesser sentence of life without parole. Poncelet, as depicted by the press, is a volatile criminal who often makes references regarding Hitler as a role model. By becoming Matt’s spiritual advisor, Helen is able to get inside the mind of a convicted killer. With letters and visits, Prejean is able to discover and understand a man that the rest of the world only views as a cold-blooded killer. Dead Man Walking closes the season July 27 – 29, 2018.